Anything Goes Challenge Blog Challenge 53-Stitches Real or Faux You Decide! Here's the thing, fancy fold cards are so cute and really fun and challenging to make and also very difficult to photograph. 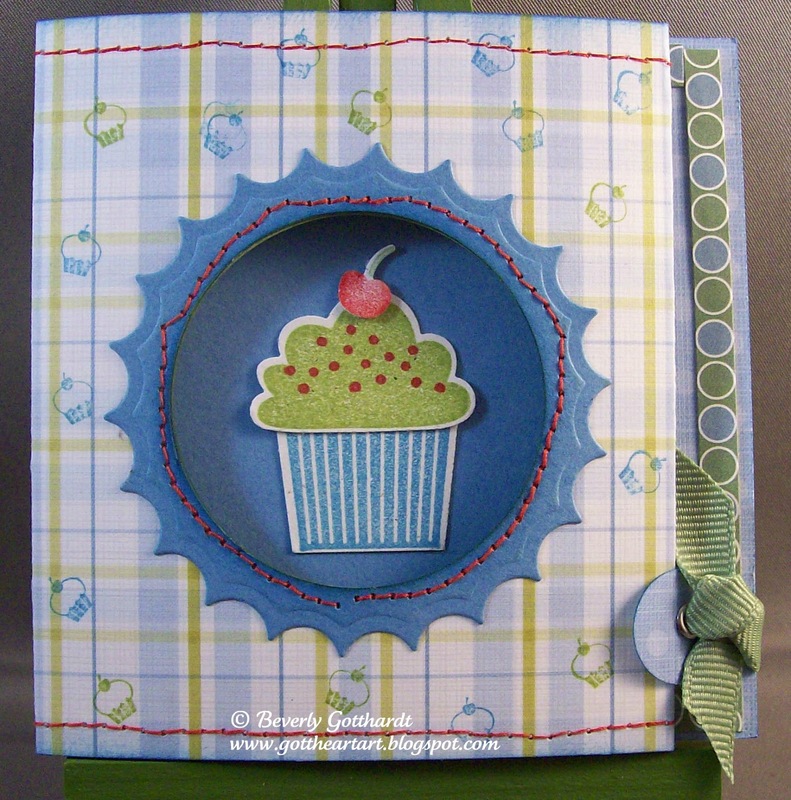 This one's a Tri-Fold, I got the instructions from Splitcoast Stampers, it's called Cami's Trifold Card. Just a little explanation, you fold the far left panel down on top of the middle panel then fold that whole sandwich on top of the far right panel and the little tab holds the whole thing shut. I brought in the red stitching to go with the red sprinkles and the red cherry and then had to cover up all the back of the stitching, worked out pretty good though. Love that 1/8" Scor-Tape. Supplies: Papers: Chatter Box double-sided card stock, Stampin Up-Marina Mist, Lucky Limeade, Naturals White, Designer Series Paper Just Add Cake, Stamps: Stampin Up-Itty Bitty Bits, Create a Cupcake, Ink: Stampin Up-Marina Mist, Not Quite Navy, Lucky Limeade, Stampin Up markers-Real Red, Wild Wasabi, Stampin Up-slit punch, Build a Cupcake punch, Fiskars circle shape cutter template, Spellbinders Nestabilities-Lg. Classic Inverted Scallop Circles, ribbon-Michael's, sewing machine, glue dot. What a fabulous card Beverley ...I love these fancy cards ... you never know what your gonna get when it opens ... love the red stitching adds a lovely pop of colour! Very cool card, Beverly. I love the way you've framed the center of the tri-fold. Thanks so much for joining us this week at Our Creative Corner!